Many folks have asked, and now it’s finally here! 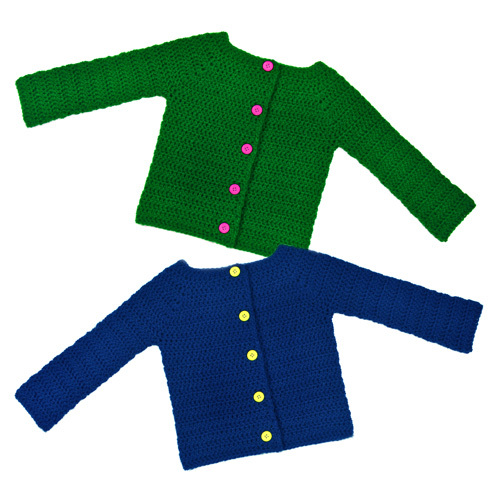 Here is my Classic Cardigan Sweater pattern in children sizes. The sweater is crocheted all in one pieces from the top down, with no sewing required (other than sewing on the buttons). It is designed to be tried on as you crochet so that you can easily adjust the size while crocheting and obtain the prefect fit. Although the pattern contains 8 sizes ranging from U.S. size 2 – 16, you can customize the sweater as you see fit by lengthening the body and sleeves. Check out the adult and baby versions that are also available in the store. This entry was posted on Saturday, October 22nd, 2016 at 12:00 AM by Rachel Choi	and is filed under Best Crochet Patterns. You can follow any responses to this entry through the RSS 2.0 feed. You can skip to the end and leave a response. Pinging is currently not allowed.